These are the items I have the most trouble using, so I’m going to assume it’s the same for you. Most of the time I’ve just been roasting them in with other root vegetables, which is honestly a very good use. If you’re roasting a chicken, throw some chopped turnips in the bottom of the pan and they’ll soak up all the juices and be delicious. This particular use allows the actual turnip and rutabaga flavors (yep, they’re there and tasty, with the right accoutrements) to shine. Before I get into sauces, though, I want to share some things. The first is that my last winter CSA share came last week. More turnips, rutabagas, parsnips, carrots, beets, cabbage, potatoes, garlic, onions, potatoes, squash. These are part of the “Maine Local Twenty” food products that are available all year long. By February, most of us are getting a little sick of winter, myself included. We have to keep finding new ways to use these same ingredients (not to mention new places to put snow). Fortunately, we have a little hope: the days are getting longer, seed catalogues are flying around everywhere, and many farms are signing people up for summer CSAs, encouraging us to dream about strawberries, cucumbers, and tomatoes. There was a recent article in the Huffington Post about how CSAs help farms and deliberates a little on other models. Basically, you get to connect with a specific farm, and that creates a deeper connection to your community, the natural world, and enables you to actually understand what it takes to produce food. MOFGA has the best list that I’ve found of CSAs in Maine; if you live elsewhere you’ll have to do your own research. Actually, there are a few CSA fairs coming up soon, if you want to check out your potential farmers in person. On another note, Nathanael Johnson of Grist (who I really like, by the way, and you should read all his things) just finished up his series of posts “Hungry Hungry Humans” exploring how we can feed the world into the future. His latest post synthesizes some of those discoveries. It’s definitely worth reading, but here’s a few tidbits about how we can feed the world: 1) Improve the lives of poor women and children, 2) Sustainable intensification through agroecology (this means more small farms), 3) Invest in infrastructure like roads, 4) Find new ways to provide capital/investment to those who need it. And of course 5) YOU can change your diet—eat less, less meat, and waste less. And find a good lentil recipe. Okay, this isn’t a lentil recipe and I know I didn’t plan that right. But it is a vegetable recipe and one that you tend to eat slowly, which means you’ll consume less. So. I also did the thing again where my mixing vessel was really not big enough for the things I was putting it in. You’d think I’d learn. Peel and chop the roots into 3/4 (ish)-inch cubes. Roast with some salt and oil in a hot (350ºF or so, it doesn’t matter too much here) oven, or if you’re tired of roasting things, sauté in a pan with a little oil for a few minutes, adding water and covering for a bit to get them all the way soft as necessary. Meanwhile, stir together the sauce. The nice thing about this kind of condiment is that it’s very forgiving. You can add a little of this, a little of that, taste, adjust, eat half of it, make a new version, whatever. I added a lot of ginger and probably too much soy sauce to start, but with a little more peanut butter it all evens out. Add water if you want it to be saucier, or put it in a blender to make it smooth. When your root veggies are soft, whichever way you’ve cooked them, dip them in the sauce and enjoy. You can put this kind of sauce on whatever. I fried some tofu the next day and dipped that in the sauce along with root veggies for lunch; and actually the inspiration came from some friends making this for noodles a few weeks ago, mixed in with veggies, etc., for a giant dinner pot. Delicious. Don’t forget to look at some local CSAs! So I had some deliberation on whether to use this title because caponata doesn’t mean much to most people. In fact I had a hard time remembering the term myself. But, we all need to learn new things, right? Ordinarily, I now understand, caponata is an eggplant dish. Not having made the original version, I have nothing to compare this with. However, I can tell you that Wikipedia’s description is fairly apt, a sweet and sour vegetable dish that could be used as either a side or main. It’s pretty exciting and has interesting flavors that I would probably never think to put together on my own. Always looking for new rutabaga outlets, I came across this recipe from Saveur and I think it’s a keeper. It should end up sweet but hearty—the flavor of the rutabaga plays nicely with the array of spices. I’ll have to try the eggplant version sometime. On another note, I broke ANOTHER paring knife. That one in the picture, actually. It’s got a good core but part of the stone piece fell off. I’ll have to find the right adhesive material. I guess maybe I am overusing them, because my larger knife feels a little flimsy and anyway mostly I’m just cooking for me, which doesn’t generally require too much knife power. Except that apparently it does. Ah, well. Start by roasting the rutabaga. Rutabaga is friendlier than squash to chop quickly, although it does have quite a thick peel that takes a little practice. Anyway, peel (with a knife) and chop into 1/2-inch cubes. Drizzle with oil and bake in a hot oven (around 400ºF) for 30 or so minutes, turning over every once in a while, until soft but not mushy. Chop the rest of the veggies. Heat up oil in the pan and cook the onions first, then when they begin to soften add in garlic, shallots, currants, and raisins. 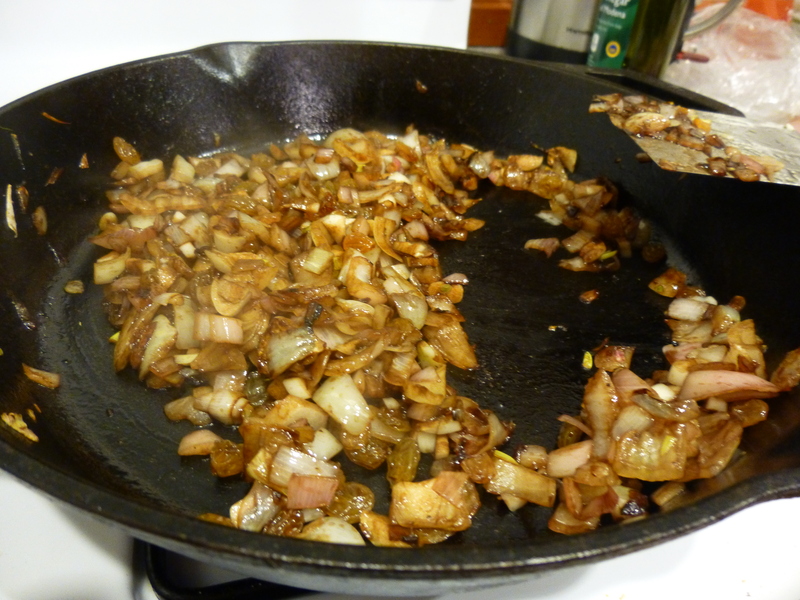 Then add the vinegar, and scrape the pan (deglaze) to collect anything that might have gotten stuck. 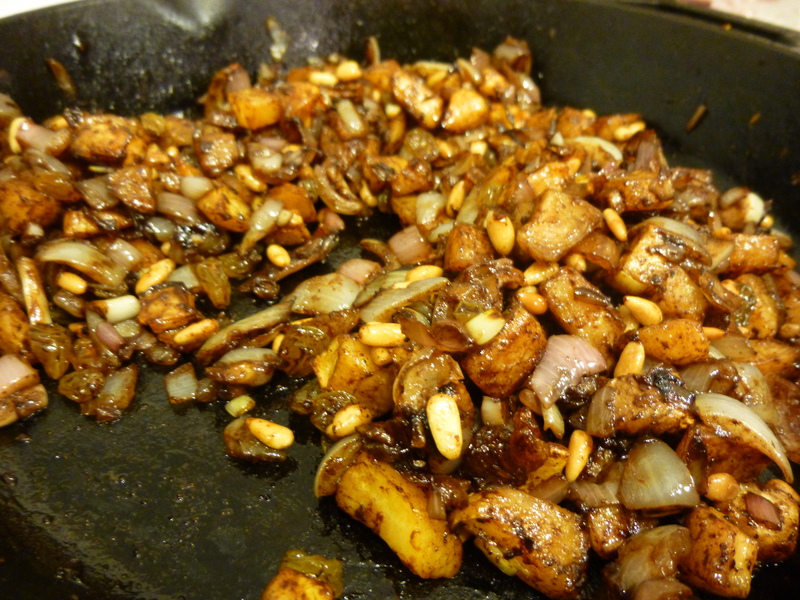 Add the pine nuts and spices, going easy on the honey and cocoa until you taste it, and adjust as necessary. I ate it with some water buffalo sausage, because I felt like, but it’s also perfectly acceptable as a main course by itself. In other news, the just 2015 Dietary Guidelines Advisory Committee released a new report detailing diet suggestions for the American populace. You can read the Executive Summary if you don’t want to get into the whole thing. Basically, though, we need to be eating more vegetables, less red meat, and considerably less sugar. If you are surprised by this, I’m glad you’re here, because you have some indoctrination in store. It’s getting harder in the winter, though. Hence the rutabagas. If you have great (read: varied) recipes for winter vegetables (turnips, cabbage, carrots, beets, potatoes), send them my way! CHOCOLATE EVERYWHERE. That is the Internet this week. Complain not I, and far be it from me to snub such a worthy tradition. Enhanced with liquor and buckets of delicious fat, no less. You can even make your own chocolate. I have not embarked on that particular mission yet, and I’m not sure that I will. Seems like a lot of time/effort/cost for something that is an international product anyway. Maybe if cacao starts growing wherever I am. Not one of my typical vegetable semi-healthy (I’m going to be honest, I’m not a health fanatic or a vegetarian, I just like veggies. Not that there is anything wrong with either of those two categories of being) recipe here, folks. It’s mid-February and you need to indulge your sensibilities. So, bread pudding. The beauty of this is that it makes use of old bread, in case you forgot to freeze half that loaf you made last week, or someone came by and left you extra bread from something that you couldn’t eat fast enough. Or, you could buy a loaf expressly for this purpose, cut it into chunks, and watch impatiently as it dries out enough to soak in eggs and cream and turn magically into rich, delicious custard smothered in deep chocolate (you don’t actually have to wait impatiently. You can just toast them in the oven. But, I’ve heard that pleasure comes more from anticipation anyway, so may as well take the time). People sometimes ask me, “Are you a cook or a baker?” Like many other areas of my life, I have yet to figure this out, and shall continue to (naïvely?) ask, “Can’t I be both?” I have been getting more and more into cooking recently (evidently), but I got my start in baking. And there is something magical about the way something can transform fantastically in a hot oven. There are many things you can do with stale bread. But this is the best, because it is chocolate. And not just chocolate, a deep, rich, thick, creamy, dark, warm, soft chocolate. I want more, now. Recipe from NPR. I have explored a number and this is the greatest. Pour rum over raisins in a small bowl and set aside for a while (side note: this is a great trick for, well, everything. Best oatmeal raisin cookies EVER). Butter a 9×13 baking dish (size doesn’t matter as much here, unlike items like cakes, so use what you have, it will somehow fit. If you have extra you can always cook mini puddings in muffin tins or little bowls). Heat up milk and cream together until quite hot (microwave or stove, your preference). Add chocolate (or pour over chocolate—I tend to heat up the milk in a Pyrex measuring cup and put the chocolate in a bowl; that way I only have a couple dishes to wash), let sit for a minute or so, then stir so chocolate is melted. Mix in eggs, sugar, vanilla, and cinnamon and stir quickly (make sure the mixture is not hot enough to cook the eggs—you don’t want them to curdle—and stir immediately. If you are worried, mix eggs, sugar, etc. separately first). Stir in raisins and rum and chocolate chunks. Place bread chunks in pan, and pour the mixture over top, trying to get as much contact with the bread as possible. Let sit for a while (at least an hour), squishing it down every now and again so that all the bread gets soaked. It will expand considerably. I also moved it around a bit to try to get an even distribution of chocolate chips. Preheat oven to 325ºF, and when both oven and bread are ready, bake for 45 min-1 hour, until custard is more or less set and the top is crispy. A knife inserted in the pudding should come out streaky but not liquidy. Serve warm, with whipped cream (spiked with rum), if desired. When you eat leftovers, I recommend warming it up (microwave is fine) and dousing with rum before consuming. On an entirely unrelated note, don’t make these mistakes with cheese! Wondering what to make for dinner? Look no further. This is from NYTimes Cooking Newsletter (so, #NYTCooking and all that), one of their no-recipe Wednesday non-recipes. Well, most of my recipes are non-recipes anyway so I’m going to give you one. I keep telling you to roast squash, so if you get bored of just eating it straight (how could you? ), this is a fabulous dish to put it in. Sweet, just a little tangy, tastes nice and toasty. And assuming you have pre-roasted squash and toasted pine nuts on hand (you should), it takes exactly the time for boiling a pot of noodles. Lemons are one of the few perishable ingredients that I keep around even though I haven’t yet seen them growing in Maine (particularly during the winter). They honestly make everything better. Modernity is good for some things. Start by putting a pot of water on to boil, since this will take the most time. If you have an electric kettle, often that will heat up water faster than a stove, so I like to put both on at the same time and then pour the kettle water into the pot when the kettle boils. Make sure to salt the water—I’ve read varying accounts as to the affect this has on the temperature of the water (not everyone is convinced that a minimal amount of salt will increase the boiling point of the water), but it makes the pasta taste way better, so do it anyway. When boiling, add the pasta to the pot. Melt the butter in a medium pan with the sage. Carefully keep it over the heat until it begins to brown, swirling gently, then stir in pine nuts and squash, take it off the heat, and swirl in the lemon juice, stopping the cooking process (browning will happen quickly, so be prepared to act). Check the pasta, and drain when done (reserve some cooking liquid to thin the sauce if necessary—I may have told you already but apparently the starch in pasta water helps sauce adhere to pasta, and is a very useful addition to thick sauces). Throw however much pasta you want to eat into the pan with the sauce and mix around, then plate and serve. Top with a little pepper and a little parmesan (or similar) if you feel so inclined. Yuum.